US Open 2015: Will Rafa Nadal be the surprise winner? By definition, a “surprise” winner is not someone you would expect to win. Is it fair to nominate Nadal today as a potential surprise winner? Why is he not a favourite? The world is not used to discard Nadal as a grand slam favourite. But we must say, this year, things have changed. Strip tennis Nadal. Picture credits: Nadal Damon Winter-the New York Times. Firstly, he hasn’t had a single big win this year. He was defeated 14 times in the last 8 months so far. In comparison in 2013 he only lost 7 games the whole year. Having lost at the 2015 French Open in the quarters (against Djokovic) because of low seeding says it all. Secondly, his preparation for the US Open didn’t go as well as he would have hoped for. He did win in Hamburg (on clay) in the beginning of August, hoping it gives him a bit of confidence. But then, he lost to Feliciano Lopez in a decisive tie-break in Cincinnati. Nadal is lacking the mental strength that made him win 14 Grand Slams. He seems to be hitting the forehands deeper and with more ferocity compared to the beginning of the year, with flashes of his old self here and there. But it is at crunch time that he has been weak this year. Indeed, he is ranked number 42 in his win-loss record when playing a decisive set this year, behind Juan Monaco, Kyrgios and Fognini among others. Out of 12 matches, he lost 10 after losing the first set. Even the matches he won, he won them showing some nerves. There was a trend that every time he led by a break and serving for a set (or a match), he played a poor game with one double fault and three forehands unforced errors. He “mini-choked”. Against some players, he still managed to win somehow, but against confident players, particularly Top 10 guys, he has been punished. Indeed, he is ranked number 29 in his win-loss record against Top 10 players this year and only won 2 out of 9 games against them. How will it be possible for him to win? The fact Nadal has been drawn to meet Djokovic in the quarters of the US Open won’t help him. Nadal has to accumulate matches, gain confidence slowly in Grand Slams to peak in the last rounds. But like in the French Open, his poor seeding will make him meet his favourite worst rival: Djokovic in the quarters. What might be different this time around for Nadal, is he is playing with no pressure. He has 0 points to defend (he missed last year’s open). Will this free him up? Also, he is meeting 18 years old Coric in the first round. How can meeting an 18 years old help him go past the mountain Djokovic in the quarter? 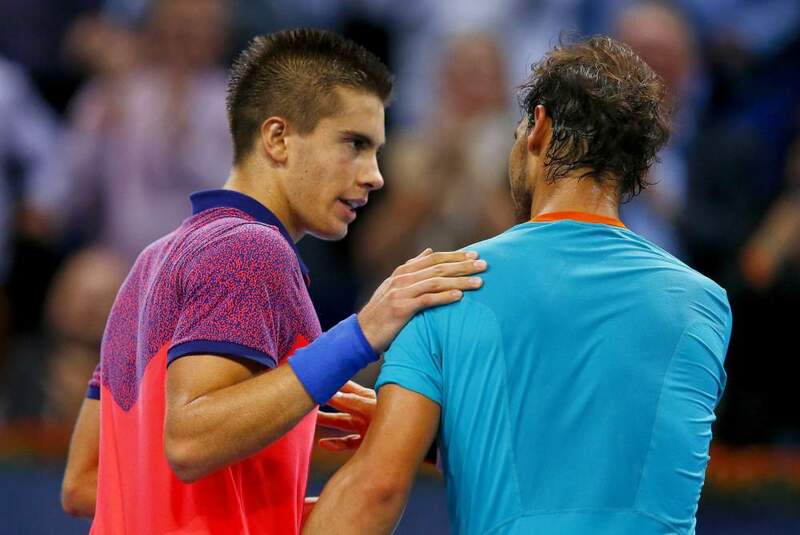 Coric after he has beaten Nadal in Basel October 24, 2014. REUTERS/Arnd Wiegmann. Well, it might not help him, because he might lose to this 18 years old Coric like he did last year in their only encounter in Zagreb in indoors. If Nadal beats Coric in a hardly fought match, where he finishes better than he starts, and where he shines mentally, he will have a huge confidence boost. Coric plays like Djokovic. Djokovic himself said that Coric reminds him of himself when he was younger. Coric has a solid backhand and forehand, can play any shot, has the power and can run quickly. Playing someone with a similar style to Djokovic might prepare him to face the world number one. If Nadal beats Coric because Coric under performs, then this match won’t be that significant for Nadal, and won’t make him that confident or better prepared for a Djokovic match up. If we look past the first round, other potential match-ups for the Spaniard are Fabio Fognini or Steve Johnson in the third round then possibly Raonic who beat Nadal in their last encounter. Basically, if Nadal reaches the quarters having fought very hard his way and up and having improved in each round, having played one five setter or saved some match points, he might be back to his best form by the time he reaches the quarters (If Djokovic reaches the quarters). This doesn’t mean Nadal will beat Djokovic, but there might be a close, extraordinary contest (Unlike the French Open.). If (and only if) Nadal beats Djokovic, it means he is back at his best, fully confident, on mentally, and will be a huge favourite to win the tournament then. But we’re far from here. So far. First step, beat 18 years old Coric in the first round of the US Open. In the world of tennis, this is quite a challenge for Rafa right now. Left picture showing Nadal’s coach and uncle credit to Pacific Coast News. 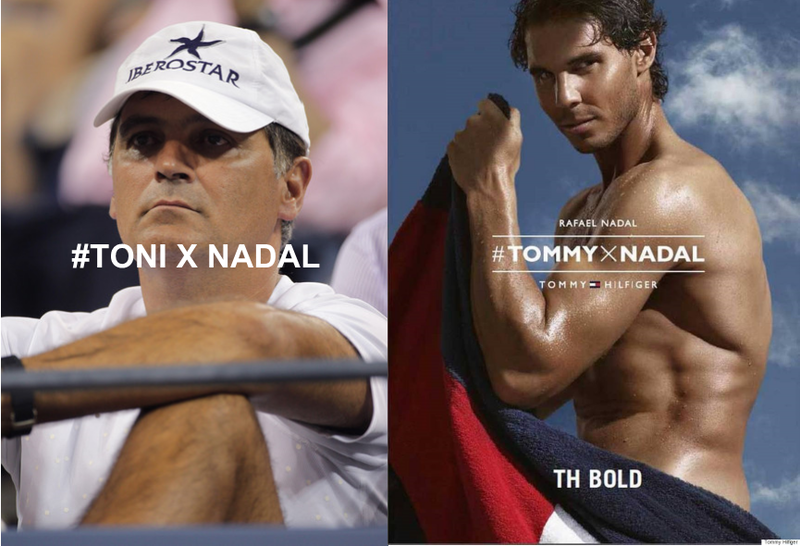 Right picture credits (many thanks) to Tommy Hilfiger. Why Nadal just won one of the most important titles of his career. French Open 2015: Do the young guns stand any chance? ← Nadine Khouri live at the Folkroom-or how to bewitch an audience.